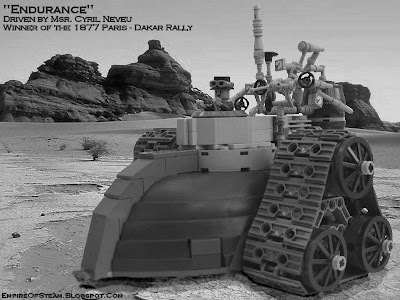 Empire of Steam - A Lego Steampunk Alternate History: The "Endurance"
In 1877 the tracked vehicle "Endurance" was to carry its designer and driver Cyril Neveu to victory in the first of the famed Paris-Dakar Rally Races. Although it proved a cumbersome and uncomfortable drive on the roads of France, falling far behind the other competitors, the Endurance was to come into her own on arrival in Algiers with the commencement of the gruelling desert stages of the seven thousand mile trek. Neveu's vehicle, designed especially for the shifting sands and merciless heat of the Libyan Desert, was to prove itself remarkably reliable, arriving at the finishing line in the Senegalese capital a full two days before any of the other racers. Neveu's victory was celebrated throughout France, hailed as a triumph of superior French engineering. The Dakar Rally was to become a keenly-contested arena in which nations would finance entries in attempts to demonstrate the might and ingenuity of their industrial bases. Much to Imperial, Prussian and American chagrin, the French were to prove the masters of desert vehicle design over and over again, winning the Dakar Rally no less than nineteen times in the next twenty years. Further images of the "Endurance" are available here for the interested reader.